I enjoyed reading your guesses last week, but no one figured out EXACTLY where I was. Heehee! Last Friday, my friend T and I attended the 33rd Annual Christmas Bizarre Bazaar. She and I are allowed one day per year together, and this is how we choose to spend it! Don't judge. I've lost track of how many years we have gone to this event, but it's a lot! We started the day off with a delicious breakfast at the Riverbound Cafe. (I tried to post their link, but it seems to be off line...bummer) Three cups of coffee, and we were ready to take that craft show by storm - but we had to hit the bathroom first!! Our timing was perfect, and we arrived just as the doors opened. Not surprising, we ARE professionals. -Make trip to car to drop off heavy bags, which are beginning to cut off our circulation. -Hit the free samples because we haven't eaten lunch, and it is now nearing dinner time. -Exit first building. Sigh. Is the day over already? -Get into car, and evaluate the day. Make notes for next year's plan of action. Sigh. Is the day over already? -Talk about next year all the way home. Doesn't that sound like the perfect day?! Alright. Who wants to go with us next year? Do you think you can hang??? Oooo - I want to go!!! I'll even stand in line for the wine slushies! Would you believe I have never ever been??? Shame on me. In my backyard and never go. And T must be a whole lotta fun if the two of you are limited to one day per year! I have never been to one, but I do love the cheese popcorn! If there is a booth for that, I am game for almost anything!!! My comment posted twice so I removed one of them. It wasn't a nasty remark, I swear! Sounds like a delightful day...I can't wrap my brain around vino frappa...merlot slushie? what???? I would love to have a day like that....ohhhh sooo funnnn. 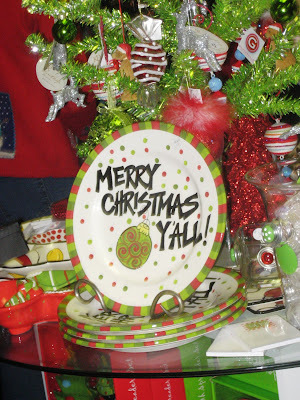 Oh, I love the Merry Christmas Y'all sign....so you. The "Merry Christmas Y'all" picture was actually taken at the Biz Baz. They weren't fond of having their booths photographed, but I snuck that one in!!!! Oooh, you lost SSG at shopping and crowds. She's kind of a BUZZKILL. But did I hear wine & popcorn? This sounds very much like how we approach DIsneyland with all your preparation and routine. I think it is great you have one day carved out of the year with your friend. You have to be deliberate about these things. you must really be feeling the Christmas spirit now. As long as I can drink dew instead of coffee I think I could hang! And to think I could have placed an order for a homemade wreath. Sign me up for next year, only instead of coffee it's mimosas. Oh I definitely could hang and want to go uber-bad! That's the kind of thing I miss doing sooo bad since H came to live with us! FrappaVino? For real? REALLY? *lol* That almost sounds too good to be true. Sounds like its truly an event to behold let alone, attend. Maybe next year I'll get brave and go to one of those things. We Mainers might be aloof (well that's really only the really really old ones), but we throw one helluva bazaar! Count me in!!!! I can hang like nobody else, girlfriend! Did they have any tampon crafts? If not, maybe, we should start on some for next year????? OK, you have inspired me. I must make my blog Christmasy or festive, oh heck, who am I kidding, I don't even have a tree up in my house yet. I did, however, put a wreath on the door before I left this morning. Sounds like my kind of shopping..I'm in.